Republicans had planned to force Democrats to clarify their stances on abolishing ICE. House Speaker Paul Ryan has canned a Republican plan to vote on a bill that would abolish ICE. Yes, a Republican plan. House Majority Whip Steve Scalise and Majority Leader Kevin McCarthy pushed the idea of putting a bill on the floor that would get rid of the agency. If a Democrat voted for it, Republicans could theoretically use it against them in the midterms. If they voted against it, they could upset their liberal base. But Ryan reportedly worried Democrats could not vote at all or could wholly reject it and undermine the GOP plan. 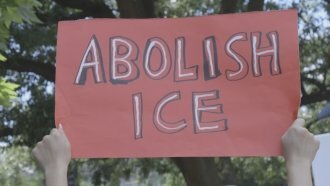 Related Story What Could The 'Abolish ICE' Movement Mean For Immigration? Some Republicans also worried giving Democrats a chance to distance themselves from an unpopular idea could backfire headed into November. Even the Democrats who had introduced the bill said they would vote against it, accusing the GOP of exploiting it. McCarthy said the House will instead vote Wednesday on a resolution supporting ICE.